I guess this book and its adjoining tour is a big deal. Palin was the Republican Vice Presidential candidate, and any book written by an almost-VP deserves some media attention. But thousands of people camping out over night for an appearance like it’s the Duke/UNC game? Certainly it has more to do with Palin’s public status than her writing prowess. I haven’t read “Going Rogue”–and I won’t–but I’m comfortable assuming it won’t be mistaken for Hemingway. So the question turns to: just why is Palin still so damn popular? When I read these passages, what sticks out is how Dowd describes the two. Obama is a politician. Palin is a B-List celebrity. Dowd even calls Palin a “conservative celebrity” before referencing Obama’s below 50 percent approval rating a few paragraphs later. Now, I’m not sure why Palin ever got so popular in the first place, and maybe I never will be. But it makes sense why her popularity remains strong now. Remember when Obama was on the campaign trail, giving speeches and dropping sound bytes, rousing the masses and inspiring thoughts of hope? Of course you do, it led to his election. What happened then? Well, he got bogged down with, you know, being president. It’s pretty easy for the public to be happy with Palin. She’s not making decisions that affect their health care or their friends/relatives in Afghanistan. “I’m looking forward to her giving me hope,” said Cheryl Geraty, waiting in the rain in Grand Rapids. The only reason why anyone gives her any attention is because she’s attractive and folksy, she doesn’t rattle any cages and she’s talks in a twang. America sops that stuff up like gravy. It just goes to show you just how dumb and superficial Americans truly are. I question the assertion that Palin is popular. I think more attention should be paid to, popular among whom and does that group equal “the American public”? I tend to think “the American public” likes Palin because she entertains not because she’s a politician who cares about policy… which is what politicians do when they’re not talking to us. 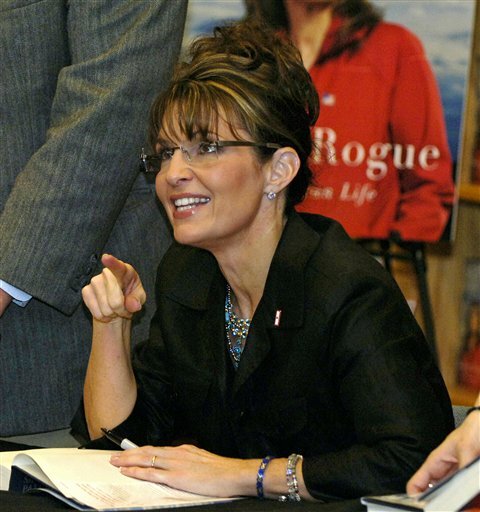 Palin wants to famous, like “Fame, I wanna live forever” type-fame. There’s nothing wrong with that but that said, I don’t get the comparison between her and Obama or any other politician.